Because I stayed neutral, I fee like there are some simple changes I could make if I wanted to, and it would still all look really good. For example, I’ve toyed with the idea of painting the kitchen island a different color. I think it would look awesome painted black, or maybe a more trendy dark green or blue. I’ve also toyed with the idea of switching out the pendants above the island. I’m not saying I’m going to do any of those things, I’m just saying that I think about it from time to time…and it would all still look good…I think. If you follow me on Instagram…and, I’m telling you, you should totally be following me on Instagram, then you know I can’t shut up about my little Smeg Electric Kettle. This thing makes me do a little happy dance every time I see it…not sure what that says about me as a person, but it is what it is. 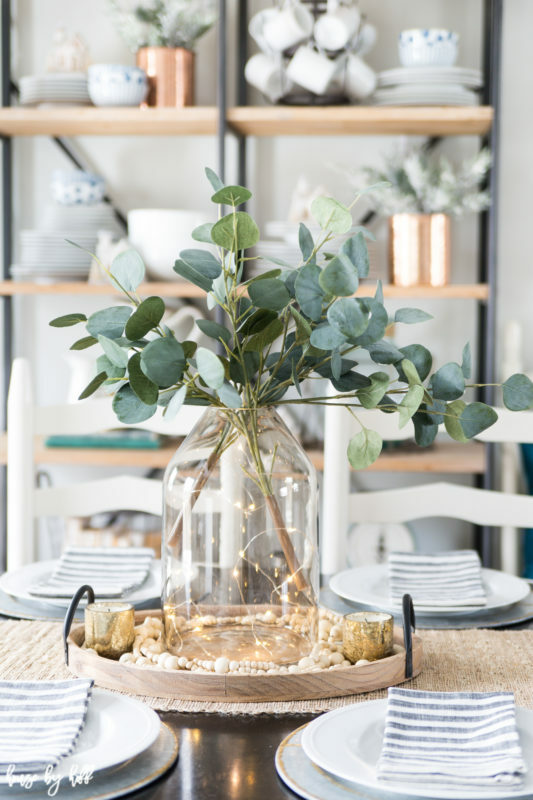 Alright, so our eating area opens up to our kitchen, and I made a super-cute (and super easy) little center piece with a vase (similar one here), some fairy lights, and eucalyptus leaves. 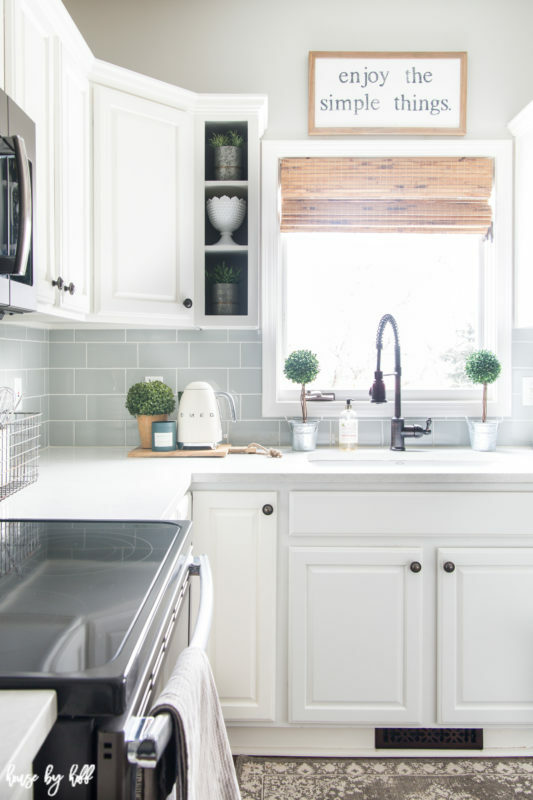 One of my favorite parts of our kitchen is the faucet. I love the statement it makes in here! I also looovvve my little Smeg Kettle. It’s just the cutest appliance to keep on the counter! 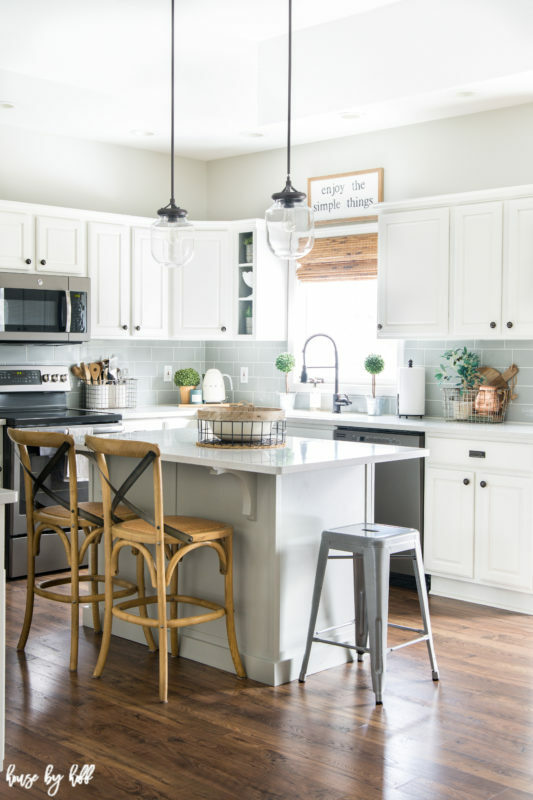 I really love ;your kitchen….you did a great job…..one question…..the top cabinet to the left of the , does it have a glass front or is it just open? I love it! Love the page. Mt wife and I are thinking of redoing our small kitchen in our beach house.. 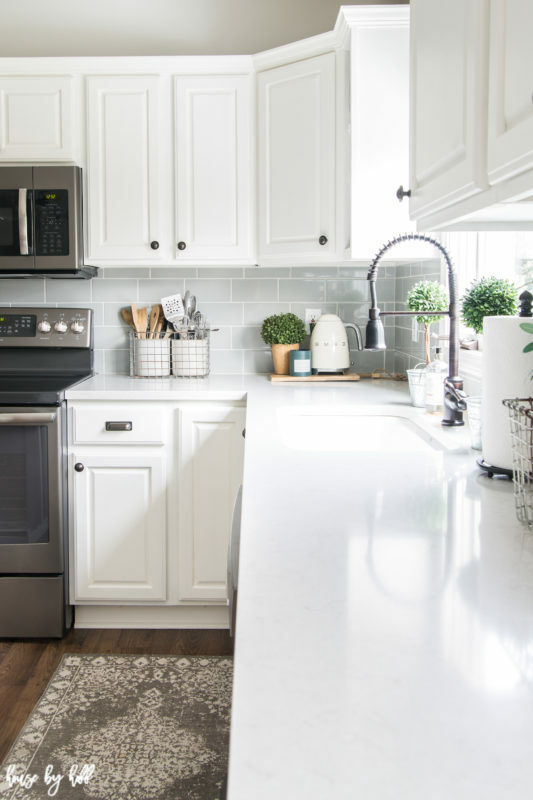 Your kitchen, simple and white, are inspiring. I tend to get too busy and over think design. I like what I see. Thanks. Hi April! I think you made some very wise decisions with your kitchen. Nothing too trendy that’s going to fade quickly. I think painting your bar black would look awesome, but only if you don’t change out those pendants, they’re gorgeous! I especially love your barstools. That little Smeg kettle is just too cute! With the choices you’ve made, I think you’ll be very happy with your kitchen for years to come. Love the kitchen! 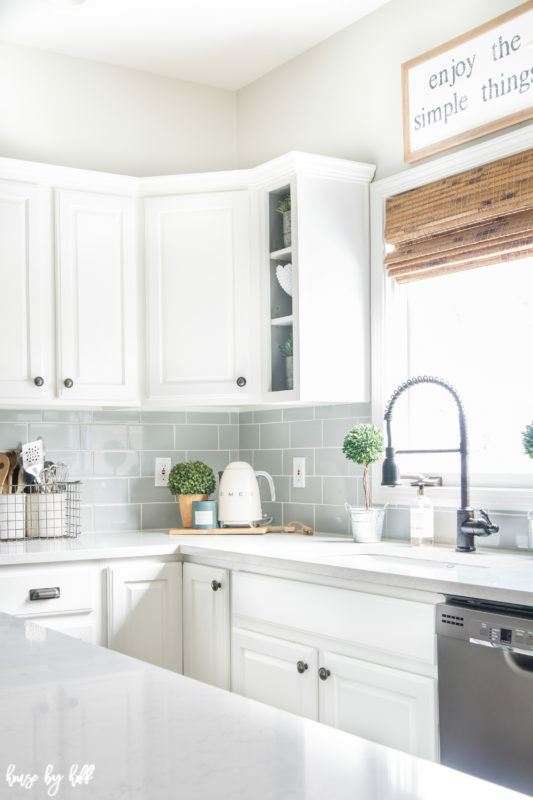 We did ours with sea salt (Sherwin Williams) walls and painted oak cabinets a greige color. The island is painted a green shade and I have a green chalkboard on the wall behind island. Light fixtures are glass and bronze oil finish. All cabinet/ drawer pulls are full silver. We love it and I don’t care what is “the style or trend”. Do what makes you happy…you spend a lot of time in the kitchen…and of course what is affordable!! Have you thought about gray for the island? It would sort of tie in with the stainless steel and back splash. The great thing about paint is you can always change it! That’s a very good point, Lorraine. 🙂 Thanks for your kind words.